As part of our efforts to simplify your communications, we have created my.alltel.com.au, a customer portal where all your account and service information can be accessed. MyAlltel is a self-managed web portal that lets you manage your Alltel services, request changes, access free reports, view bills, and make payments. Head over to my.alltel.com.au to get started. To access the portal for the first time, enter your email address together with the password we have provided to you via email. As a security measure, change the default password immediately after your first log-in. Dashboard: Customise which key information are displayed immediately after logging in. Services: View and manage your Alltel services. Make a Change: Request and make changes to your services and account information. This includes changes to billing details, and direct debit or credit card details. Statements: View all of your monthly statements, including your payment history. Transactions: View full details of your transactions and payment history. Make a Payment: Pay your bill directly through the portal. Edit Payment details: Update and change your credit card or direct debit information. Company details: Your company details and authorised contact details are listed here. Critical Information Summaries: Access the Critical Information Summaries of all Alltel products and services. Manage people: Grant and customise your team’s portal access here. My Details: View and edit your account details and password here. Logout: Exit and sign out from the My.Alltel portal. Click the Manage Users button on the top right of the screen. Click the Add a New Person button. Enter the user's email address and select an access level. Admin: Has full access to everything in your portal. This includes the ability to add and edit user accounts. 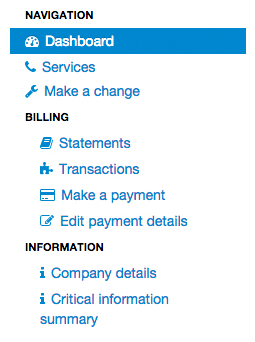 Billing: Has access to your invoices and billing information, with the ability to pay bills online. This is ideal if you outsource your bookkeeping. Reporter: Can generate and view reports about your services. This is ideal for sharing details with your marketing team. Once the user details are saved, the system will send instructions to the new user’s designated email about how to start using their account. 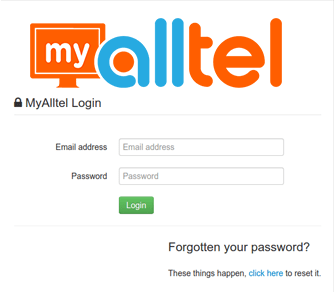 Your dashboard is the first page you see when you log into your My.Alltel portal. It gives you an overview of your account’s key information at a glance. To add new information, select a category underneath Add to my dashboard. To rearrange the information widgets on the page, simply click their heading bars, and drag and drop to your preferred position. To remove existing information on your dashboard, click X on the heading bar of the widget to be closed. To make room for more widgets on a single screen, click the + Add Column button. Most of the information on these widgets can be converted into an Excel spreadsheet. To export the information, simply click the Download icon. Changes to your services, account, and billing details can be submitted directly through the portal. Go to Make a new change under the Navigation menu. 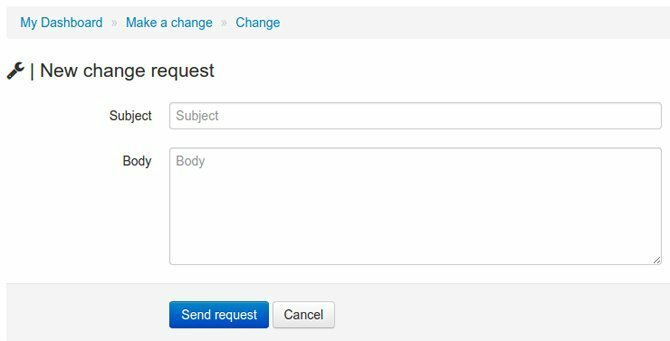 Click Create a new request from the drop-down. Support - request assistance from Alltel’s support team. Change - request a change to your services, or advise us of new contact/billing details. Credit Card Change or Direct Debit Change - request changes to your payment method. Fill in the details for your request, and then click the Save button to send the request to our Customer Service Team. If you’re sending us a support or change request, be sure to provide all of the information we’ll need to be able to help you! Tick the box beside ‘Email me a copy of my monthly statement…’ on the top-right corner of your screen, and click Update. You can also click ↓ Download for a copy of individual statements. This is your portal, and we’d love to hear how we can make your experience better! Let us know if you have any questions, and tell us what new features you’d like to see added. Give us a call at 1300 255 835, or send an email to support@alltel.com.au. Logging in My.alltel menu Creating a new user Dashboard Submitting a change request Receive your monthly statements by email What else would you like to see?